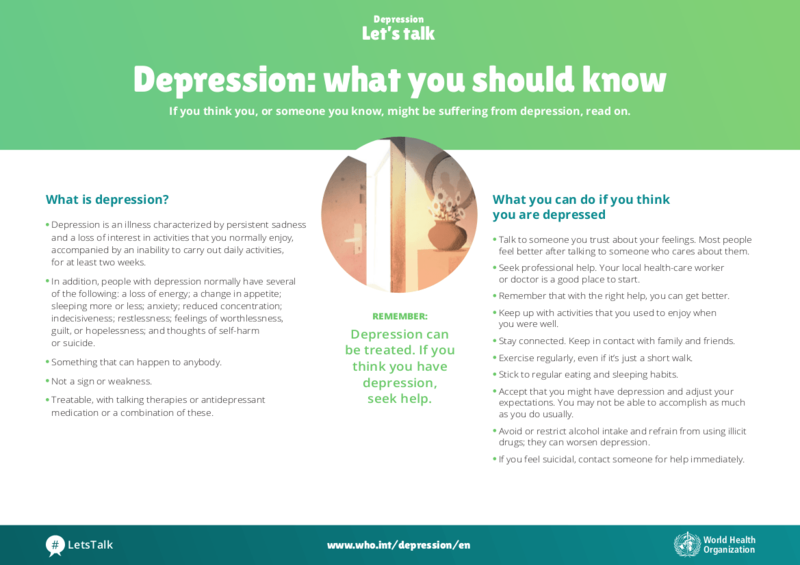 Depression is a low mood that causes people to experience depressed mood, loss of interest or pleasure, feelings of guilt or low self-worth, disturbed sleep or appetite, low energy, and poor concentration. It lasts for a long time, and affects your everyday life. Depression in it’s mildest form can just mean being in low spirits, but it’s more than just feeling down or sad. Depression will cause a person to have intense feelings of hopelessness, negativity and helplessness which they find very difficult to get rid of. It can happen to anyone. Many successful and famous people who seem to have everything going for them battle with this problem. Depression also affects people of every age. Experiencing depression can make it difficult to find the energy to look after yourself. Taking an active role in your treatment, and taking steps to help yourself cope with your experiences, can make a big difference to how you feel. Getting a good sleep can help to improve your mood and increase your energy levels. Eating a balanced and nutritious diet can help you feel well and think more clearly. Many people find exercise a challenge but gentle activities like yoga, swimming or walking can be a big boost to your mood. When you’re experiencing depression, it’s easy for hygiene to not feel like a priority. But small things, like taking a shower and getting fully dressed whether or not you’re going out of the house, can make a big difference to how you feel. While you might want to use drugs or alcohol to cope with any difficult feelings, in the long run they can make you feel a lot worse. Try making a list of activities, people and places that make you happy or feel good and then try to find ways of bringing those things into your daily routine. Treat yourself when you’re feeling down. Try to do at least one positive thing for yourself every day. This could be taking the time for a long bath, spending time with a pet or reading your favourite book. Boost your resilience – you could do this by creating a list of activities you know improve your mood, or you could fill an actual box with things to do to cheer yourself up when you’re not feeling your best. Be kind to yourself – try not to beat yourself up too much when things don’t go to plan or you find yourself feeling low. Treat yourself like you would a friend and go easy on yourself. Try joining a community group, sports team or other hobby group. The important thing is to find an activity you enjoy, or perhaps something you’ve always wanted to try, to help you feel motivated. Try something new, like starting a new hobby, learning something new or even trying new food, can help boost your mood and break unhelpful patterns of thinking and behaviour. Try volunteering, this can help in making yourself feel better by helping others and also help you feel less alone. Remember, that whilst it would be beneficial to get out and do these things if you’re not feeling your best it can be difficult, so make sure you set yourself achievable goals. If you can achieve realistic goals can help you feel good and boost your self-confidence, and help you move on to bigger ones. Keep a mood diary – this can help you keep track of any changes in your mood, and you might find that you have more good days than you think. It can also help you notice if any activities, places or people make you feel better or worse. 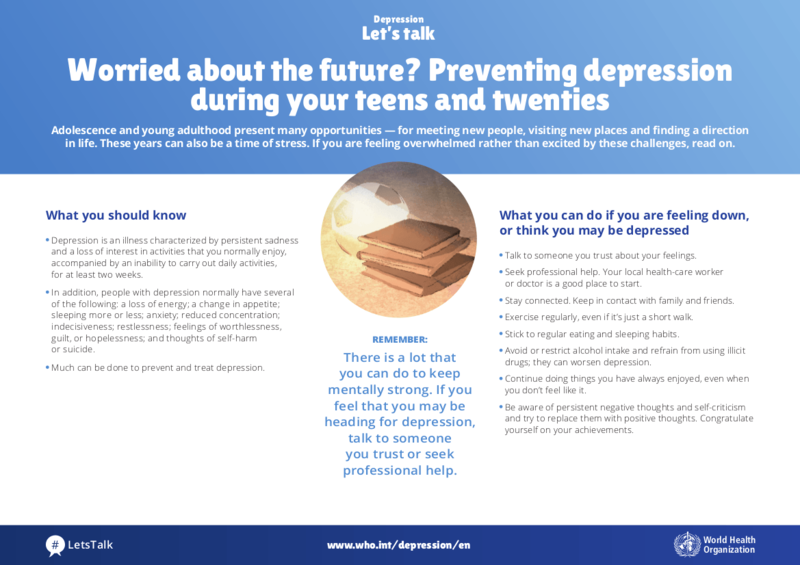 Challenge your negative thinking – Students Against Depression have lots of information on this. Contact a helpline if you’re struggling with difficult feelings, and you can’t talk to someone you know, there are many helplines you can contact where you can speak to people who are trained to listen and could help you feel more able to cope with your low mood. Keep in touch with friends and family. If you don’t feel up to seeing people in person, or talking, send them a text or email. It might feel hard to start talking to your friends and family about what you’re feeling, but many people find that just sharing their experiences can help them feel better. Join a support group or attend a programme. Going to a support group or a programme is a great way to share tips and meet other people who are going through similar things. Use online support – this can be useful when you don’t feel able to do things in person. Online support is another, useful means of building a support network for yourself. Below are some of the common signs and symptoms of depression. 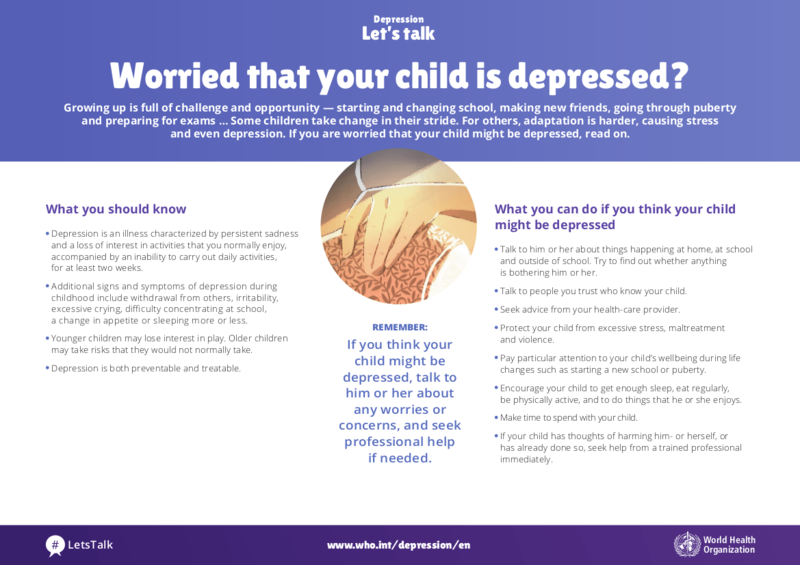 There are many symptoms of depression, including low mood, feelings of hopelessness, low self-esteem, lethargy and sleep problems. The more symptoms someone has, the more likely they are to be depressed. The NHS have an online self-assessment tool which, whilst it shouldn't replace a consultation with your GP, will help you to assess whether you could be depressed. You can't force anyone to get help if they don't want it, so it's important to reassure your loved one that it's OK to ask for help and that it is available. Lots of people can find it hard to open up and speak about how they're feeling. 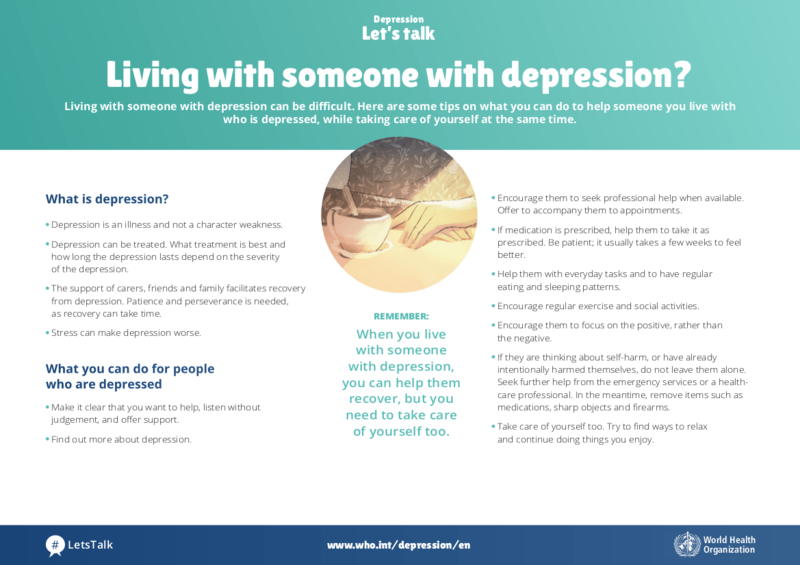 Try to be open about depression and difficult emotions so your friend or family member knows it's OK to talk about what they are experiencing. You don't even need to say anything, sometimes just having someone who is willing to listen to you without judgement will make the person feel less alone. If you've not experienced depression yourself, it can be hard to understand why your friend or family member can't just 'snap out of it'. 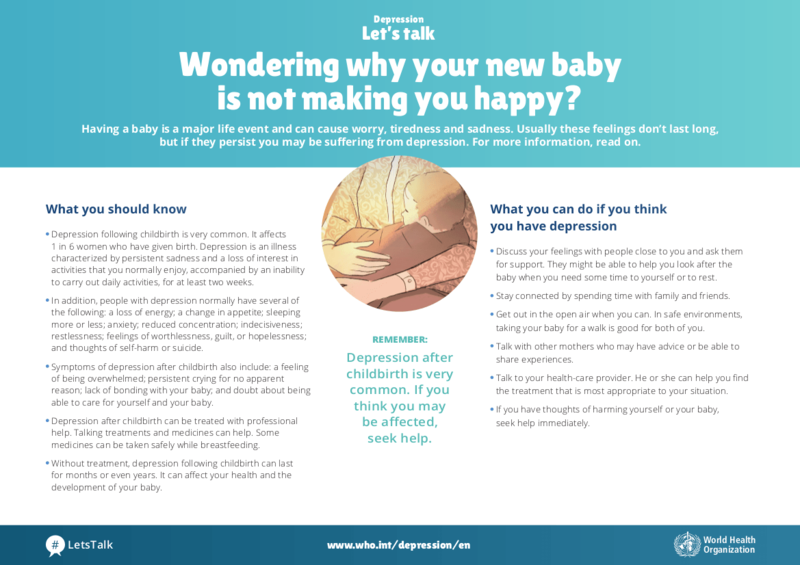 Try not to blame them or put too much pressure on them to get better straight away – your loved one is probably being very critical and harsh towards themselves already. If someone is struggling, you might feel like you should take care of everything for them. While it might be useful to offer to help them do things, like keep on top of the housework or cook healthy meals, it's also important to encourage them to do things for themselves. Everyone will need different support, so talk to your friend or family member about what they might find useful to have your help with, and identify things they can try to do themselves. Your mental health is important too, and looking after someone else could put a strain on your wellbeing. If you are concerned about your mental health and feeling depressed speak to your GP or a health care professional.